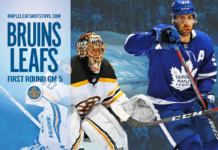 29 games into the season, Leafs Nation will finally witness their squad at full strength tonight as the Toronto Maple Leafs look to extend their winning streak to six games — eight on home ice — against the Detroit Red Wings at Scotiabank Arena (7 p.m. EST, Sportsnet Ontario). As mentioned in the last game preview, Nylander’s return (#29 returns in game #29!) 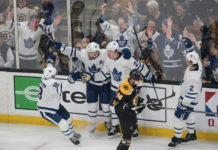 is a huge boost for the makeup of the entire Leafs lineup, elevating their forward depth to a level that only teams like Tampa Bay, Winnipeg, and Pittsburgh can come close to rivalling. As a reminder of what kind of player the Leafs are getting back in their lineup, there is some great data here from Mike Kelly that agrees with the eye test on the many strengths of Nylander’s game: How effective of a puck transporter he is traversing three zones, his skills as a play creator in the offensive zone, and his puck-tracking ability through the neutral zone that generates takeaways with the skills to turn them into instant offense transitioning the other way. That’s to say nothing of his high-powered shooting release. All that said, expectations do need to be kept in check for his first couple of games back in the lineup as he has missed training camp and two full months of regular season action, with only some practice skates with European teams and no competitive action under his belt since last May. One of the biggest trickle-down benefactors of Nylander’s return is Nazem Kadri, who will start playing more regularly with skilled linemates. Johnsson and Kadri, in particular, have worked well together since last year’s playoffs. All three players on this new “third line” are committed defensively, can cycle, and can generate shots/chances at an above-average rate. It’s a good second line on many teams in the NHL. After some conflicting reports, Babcock confirmed he’s resting Frederik Andersen tonight and starting Garret Sparks in a departure from the approach of playing Andersen every single night except in back-to-back situations. Andersen has started the team’s last four games, facing at least 40 shots in all of them. Considering he’s on pace for over 60 starts once again and there isn’t another back-to-back until just before Christmas, it’s wise to let Sparks take on more at this point in the season against a weaker opponent — one that is missing Darren Helm, Danny DeKeyser and Anthony Mantha due to injury and Tyler Bertuzzi due to suspension — with an eye towards the Spring. He’s just got to keep his shifts short. Just got to be detailed and work. Everything else is a bonus. It’s going to take him some time, no question about it. If it’s not working, we’ve got tons of guys to move around and go with different options, but [with Matthews] is where we’d like him to start. In general, his impact on the game… When he skated yesterday, he was strong, great edges, shot the puck. He’s an intelligent player. Once he gets up to speed, it’ll be real good. We expect him to have energy here tonight — he should be the freshest guy in hockey, I would think. They look good. They’re one of the top teams in the league there since the end of October. They’ve played well, played with good pace. Some real good young players there. Last time I saw them, they had three more players. I mean, that’s the way it goes. They both can fly. I think Kappy’s a little different. He can just flat out fly, right? It’s hard to really see anyone beating him in a one-on -ne race up and down the ice. Willy is shifty. They both shoot the puck. I think Kappy’s probably more of a shoot-first guy and Willy’s probably more of a pass-first guy. I’ve enjoyed playing with both of them. When you are shorthanded, you better make up for it with work ethic and compete. We have to make sure that we really work and compete and try to outwork and outcompete them and out-detail them every shift. We’ve got to be great in those areas and rise to the occasion. They’re a good team and we know that. Every time that we go out and play our best, we put ourselves in a position to win. Danny has been real good. It’s fortunate, especially for him, because he’s been excellent. Probably the best hockey he’s played in the four years I’ve been here. That’s an unfortunate loss but that is part of sports. You’ve got to make sure other guys step in. How much you feel a loss always depends on how well the guys who step into those roles play. Our d-men have to be at the top of their game here in Danny’s absence.